Der Panther/M10 ist ein deutscher premium mittlerer Panzer der Stufe 7. 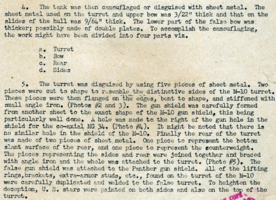 The Panther/M10 shares the same gun as the E25. 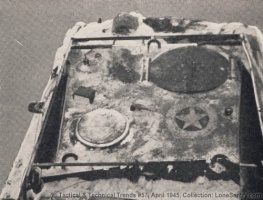 This tank was removed from sale in the gift shop and to buy for gold via the in game tech tree on the 4/5/15 with the release of 9.7 Premium Tanks: Removal from Sales as part of the WG retirement plan. It was on sale 2-5 October 2015 for the SEA server as a "Collector's Gem" special, and again on NA and SEA until mid (17th SEA) November 2015 as part of a large "Appetisers" bundle. As well as on EU-Server during 4-7 October 2016. Good maneuvering: Great track traverse for angling, relocating, or retreating. Similar power-to-weight/ground resistance as Panther. 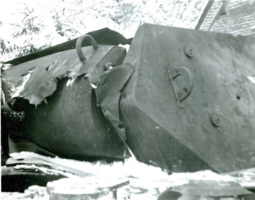 Capable of hull-down: Wide and 100mm+ thick gun mantlet with few weakspots, with decent gun depression for ridges. In some ways the tank is like a hybrid of the weighty armour and gun maneuvering-dispersion of the Panther, with the Leopard 1 Line's VK 3001D's matchmaking, agility, extra gun depression, but sadly also its poor rate of fire. Pz.Kpfw. 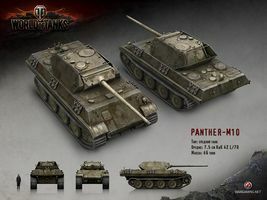 V Panther drivers will realize that the M10 variant has not only hard but also soft differences from the normal tank, notably the lack of the comical L/100 gun and a true Schmalturm (although with the mantlet, the true difference in armour between the turrets is quite small on either tank), but also higher traverse speed. Accordingly, the Panther M10 has improved aim time, accuracy, and firerate with the undertiered L/70 gun, limiting it to side shots and flanking against its highest tier opponents at tier 8. The bonus is the tank's low repair cost and high credit income makes it a better credit maker compared to the other tanks. The Panther/M10 is the first tank to sport a different color from the rest of the tanks of its nation. Instead of German grey, it is American olive drab; and as of 8.6, it sports the American star rather than the Iron Cross. As of 8.9, American camouflage patterns and inscriptions are available for it, and it also receives stars on the barrel instead of triple rings for it's Marks of Excellence. With this tank's strengths and weaknesses it can take on some tier 7 or lower tanks alone, but be wary of focus fire. 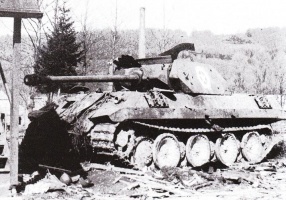 A big problem for this tank is its very low alpha, making this tank highly vulnerable in a frontal assault against thickly armored tanks, such as the KV-4 and AT-15, with their large health pools, and high alpha weaponry. Even though this tank has only an average of 135 damage per shot, you can still deal a good amount of damage even to tanks such as the T29 or Tiger I, espcially if you can flank them or aim for their weak spots. Disabling critical modules will allow you to gain control of the situation, albeit with some skill required. Always keep in mind that with this tank you are a dedicated support unit, with your role being to harass and flank your enemy in order to assist your team mates. As a result, always aim for enemies' tracks, engine, or any other vulnerable parts of the vehicle that can disabled: it will let your team finish the job. With great accuracy and an okay fire rate, you can often perma-track heavies or break through TDs that you would normally be useless against. As a support unit, you should always be watching the flanks and trying to keep up with and get around the movements of your enemies if possible, since you do not want to be the person that misses the scouts breaking through your lines of defense. Here, the good turret traverse speed, firerate, and accuracy make it excellent at tracking and killing scouts. Keep in mind that many heavy tanks are available at tier 7 and 8, and putting the M10 on the front lines will result in a swift trip back to the garage. Get around your enemy and stay at range. This tank excels especially when played in a wolf pack of two or more mediums in a platoon. A wolf pack is able to deal considerable damage to enemy tanks that have been separated from their allies, and often consists of flanking and overwhelming isolated targets. Do not judge its armor too harshly - it is able to bounce shots from many vehicles in a similar fashion to the original Panther in game, even being able to occasionally bounce the KV-85/IS' 122mm guns with a good angle. 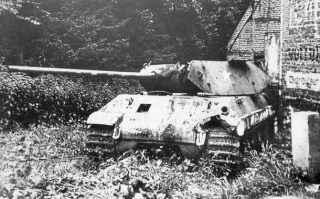 The Panther/M10 also lacks a cupola; it was historically removed as part of its disguise. This is reflected in its view range, but makes it strong in hull-down locations. The gun mantlet has a habit of eating shots, but don't place too much trust into it. Due to its high profile, its camouflage values are a bit lacking. If you're using it as a dedicated sniper, training the Camouflage skill is a definite requirement along with equipping a camouflage net and paint. The false rear was made of sheet metal. 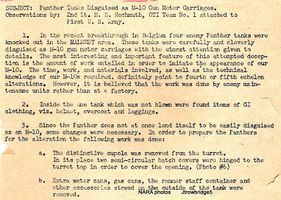 It was a faithful duplicate of the M10 rear except for two holes to permit the twin exhaust elbows of the Panther to protrude. 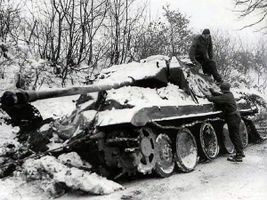 An attempt was made to imitate the skirting armor of the M10 which appears to hang lower than the side armor of the Panther and is bevelled in at the bottom. 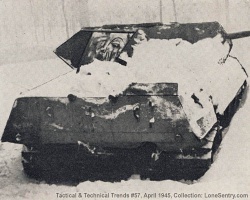 A long flat strip of sheet metal was attached to the sides parallel to the ground, and a vertical sheet strip was attached at right angles to this strip to give the appearance of low skirting armor. 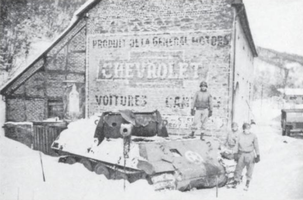 While a few of the jeep commando teams easily slipped through American sentries and roamed freely behind American lines, but the rest of the unit languished with Sixth Panzer Armee. When it became apparent that no breakthrough was going to occur, the "Ersatz M-10's" were committed along with the rest of the brigade as a normal combat unit. Ultimately, all of the vehicles were destroyed or disabled in the fighting. 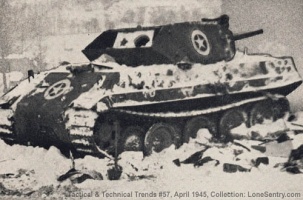 Panther/M10s deployed during the Battle of the Bulge actually had muzzle brakes (see intelligence report under 'Historical Gallery'). 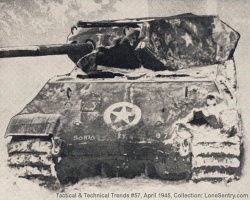 Contrary to the in-game description, the Panther/M10 actually saw action on 21 December 1944, not February 1945 which was a month after the Battle of the Bulge had ended.